THE perfect antidote to a hot, muggy day is a refreshing, cold soup. At least that’s one of mine. And I’ve been wanting to find a reliable ajo blanco recipe for a year now. Put the breadcrumbs in a large bowl and cover with water. Soak for 15 minutes. 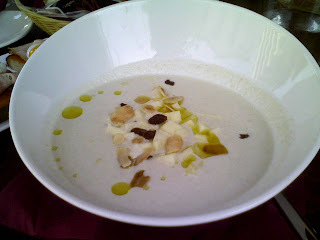 Meanwhile, put the garlic, olive oil, sherry vinegar and almonds in a food processor and blend well. Drain the breadcrumbs and add to the food processor. Blend well. While the processor is running, add the chilled water until you get the consistency you want. I prefer an almost-thin soup. Stop the processor and taste. Season with salt and pepper to your liking. You can either serve right away or chill the soup for an hour or so. Garnish with slivered almonds, sliced grapes and drizzle a tad of olive oil on top.